Long Beach condo, beach resort home in Perdido Key. This 3 bedroom, 3 full bath 6th floor Long Beach condominium features a spacious amount of living space with oceanfront views from wall-to-wall and floor-to-ceiling windows in the living area and all 3 bedrooms. The lockout third bedroom has a luxurious wet bar and mini fridge for your vacation enjoyment. All 3 bedrooms have balcony access for you to enjoy the sun, sand and waves. A very rare unit with all bedrooms directly on the crystal blue water and white sand beaches of Panama City Beach! Our vacation rental sleeps 10 in beds, with a king-size bed in the master bedroom, 2 queen size beds in the second bedroom and a king bed in the lockout third bedroom. Living room has a cable TV with DVD player. All bedrooms have cable TV's. Lounge and swim at any of our three pools with hot tubs, including a 6500 square foot lagoon pool with island water falls. There is also an on-site rental facility for jet-ski and parasail activities. 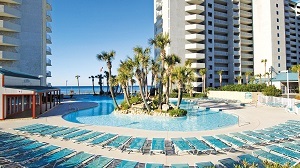 Long Beach Condo Rental in Panama City Beach FL.